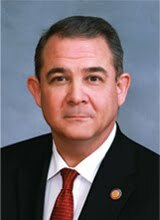 Republican state Rep. Stephen LaRoque, who represents Kinston in the General Assembly and who is a BIG hater of the federal government and the waste of taxpayer's money, is himself slopping at the federal trough. He’s earned up to $195,000 a year heading the two small economic development organizations—the East Carolina Development Company and Piedmont Development Company—and used the non-profits to loan some of the public funds to his close associates and political allies. LaRoque, now in a leadership position at the N.C. General Assembly, refused to answer questions about the management of his non-profits.